Bob Allen talks about U.S. stamp collecting, providing information on topics such as the history of United States stamps, their design and production processes, regular issues and commemoratives, and special features such as perforations, watermarks and secret marks. Like many collectors, I collected when I was a child, and then I became interested again in the ‘90s. I think eBay and other Internet auction sales had a little bit to do with it. I just started playing with stamps and got interested again. Living in Hawaii, you don’t have the option of going to dealers all around the country, and a lot of the bigger ones are on the East Coast. There are a couple of stamp dealers in Hawaii, but not that many. Collectors Weekly: Do you specialize in specific types of stamps? Allen: All the really heavily collected stamps are before 1930 for the most part, although stamps after 1930 that are errors or special usages may be worth a premium. What I’ve been trying to do recently is to provide an identifier for all United States stamps, but the sheer number of the commemoratives after 1970 is overwhelming. Plus, there are copyright restrictions. The post office used to be called the United States Post Office Department. In 1971, it became the United States Postal Service, and there were copyright restrictions and all kinds of things that went into effect at that point. So 1970 is just a convenient date to draw the line. A lot of the images on my site come from what are called proofs. Because it’s an educational site, it’s not really so important that the stamps are perfect images of the real stamp. A lot of them are photo-edited to give a better look, but it doesn’t change the fact that their primary purpose is for identification, not for resale. That may be a gray area, but I feel that it serves its purpose. At this point, I look for anything that I can use that will enhance the website and would be helpful in identifying a particular variety or color or something like that. When I first started out, there was a treasure hunting aspect. You’re hoping that you’ll find that one rare stamp in a pile, but the stamps have been so well picked over, it’s really unusual. I guess it’s like going down to the beach and taking your metal detector and trying to find something. That aspect of the hobby I left a long time ago, but when I started, that’s pretty much what I was drawn to. Collectors Weekly: You mentioned that you’re most drawn to the designs of the stamps. Allen: Right. Including the proofs and essays. There’s a whole bunch of things that go into making a stamp. That’s something I really would like to promote, to get new collectors to understand that there’s so much that goes into the production of stamps. If you understand what goes into making a stamp, it makes the collecting that much more enjoyable – and easier. The essay is the original drawing that’s submitted to a review board that decides which stamps will be issued. When that’s decided on, they print up what’s called a proof, and the proof lets people look at what the final product will look like. The proofs look just like the real stamp, but they’re usually really crisp and clean. They don’t have perforations (the little things around the edges) that regular stamps do. A lot of them are on cardboard, and they’re usually much cheaper than the actual stamps. So they serve two purposes: they’re affordable and usually have a much better quality image. That’s why so many of the stamps on my site are proofs. In fact, the new identifiers that I’m going to be doing this summer will be almost all proofs, up until 1900 anyway. After 1900, the stamps become a lot more affordable and the proofs become more expensive, so after about 1900, I’m switching back to stamps again. Collectors Weekly: Why would the proofs be more expensive after 1900? Allen: The main reason is that most of the proofs were printed in the 1870s and 1880s. After the turn of the century, there were many people that started collecting, and all those collectors saved so many of them, that unused examples became much more common. One of the great ironies is that there were too many stamp collectors during the Great Depression, and they all thought that if they had stamps from the post office, particularly the low value, 1- and 2- and 3-cent stamps, that they would be worth a lot of money in a very short amount of time. So many stamps were saved, and now 80 years later people are trying to sell the same stamps and they have to sell them at a discount. If someone had bought a hundred dollars worth of stamps from the Post Ofiice in 1935, they, or their heirs, would sell the same stamps for maybe $80 or $85 now. They would be selling at a substantial discount now over what they paid in 1935. There are some sad things in collecting United States stamps. First day covers are another one. A lot of people get first day issues and they think that they will be worth money someday, but most of them won’t be worth what they paid for them. Collectors Weekly: What do you find most interesting about the stamp design process? Allen: I find the engraving process interesting. There are people called engravers and siderographers, the people that actually do the engraving. They’re workmen, but I find what they do and that they do it in reverse very impressive. In the beginning, a lot of stamps were printed using what’s called the flat plate method. It’s a complicated process with several steps involved. But they finally end up with a plate with reversed images of all the stamps in recess on the plate. They press the plate against the paper, which is slightly moist, and the ink fits inside the little depressions in the plate, that’s the image of the stamp. The ink is raised on the surface of the paper when it’s printed. If you run your finger over the stamps, you can actually feel the ink laying on top of the paper and that’s how you know that it’s a genuine stamp. It’s hard to reproduce. That’s the way most of the stamps were printed until about 1910 or so, and they started going to a process called the rotary press. That was a little bit faster. They print them in rolls rather than sheets, but they still use plates. They used curved plates because it’s a rotary thing, but it still left the ink on top of the paper, raised slightly. For the most part, that’s how stamps were printed up until about the 1980’s. Collectors Weekly: Was there a difference in quality between flat plate and rotary printing? Allen: There’s only a minor difference in quality between flat plate and rotary printing – the ink is still raised in both cases. I think the flat plates are the more beautiful stamps, but there are some really well done rotary printings also. You can really tell the difference between the older printings and stamps printed within the last forty years or so. If you take a stamp from the 1930s and compare it to a stamp made in the 1980s or 1990s, it has that old-timey look. The thing that’s so nice about that old-timey look is that the ink is raised on the paper. You can sense that there’s just something special about them. It’s aesthetically pleasing. The small details are what separate the really rare stamps, especially the 20th-century stamps. The really rare stamps are rotary stamps that were perforated using the flat plate perforator. If you look at the two stamps, 99 out of a hundred people could not even begin to tell the difference between the two, but a specialist or somebody that really studies the stamps will look at it and go, “Wow,” and the stamp might be worth hundreds of thousands of dollars. So there are needles in a haystack that you still can find, but, again, they’re needles in a huge haystack. On the Internet, it’s tough to tell the difference because in some cases you have to hold the stamp in your hand to tell what’s going on or you have to measure it. But there are tricks you can use, for example, you can copy and paste into Photoshop and compare the stamp in question with a known stamp. 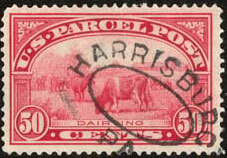 You can compare perforations, design size, color and other factors just by overlapping the stamps slightly, and you can sometimes tell if the stamp in question is the rarer variety. So it’s possible to do, but it’s a lot of work. Collectors Weekly: How has the paper that the stamp was engraved on changed? Allen: That’s always changing. They always come up with new papers. In the last 20 years, they’ve farmed out a lot of their printing jobs to other companies, and so the paper is really changing now. And then, of course, they’re not using the old gum. They’re using the self-stick adhesives. The paper variety can make a lot of difference in the value of a stamp, but it’s not just value. I think all stamp collectors are partially obsessive compulsive, and they want to have one of each variety of each stamp. So if a stamp is known with two paper varieties and one of them happens to be really rare, people will go nuts. There’s a bunch of Washington/Franklin stamps from a 1908 series that were printed in 1909 on a high rag content paper called blue paper. Those stamps are really rare and very highly collectible. If you happen to run across one of those – actually it’s not really blue; it looks grayish – you’ve really had a good day. I’ve never found one. You can’t really tell on eBay or looking at the Internet. It’s really hard to tell just by looking at a scan. You’d actually have to have the stamp in your hand to tell. There are other paper varieties and there are watermarks that make a huge difference. But a collector wants to have one of each kind of watermark. The stamp looks exactly the same but it might have what’s called a double-line watermark or a single line watermark or it may have no watermark. It may have all these different kinds of perforations. It may be on different kinds of paper. The plate could have a flaw in it. There could be a little something extra to the stamp that doesn’t belong there or something missing. Those kind of things are really collectible. Collectors Weekly: What did the watermark signify? Allen: The purpose of the watermark is pretty much the same as why the ink is raised. It’s a security feature in a sense because it’s hard to duplicate. If you hold the paper up to the light, you should be able to see the watermark through the paper. That’s in theory what a watermark is, but in actuality it really didn’t work out very well. I have a lot of stamps that I know have to have a watermark, and I have a really rough time finding any watermark in the stamp. But I know that it has it because that stamp was only made on watermarked paper, but I still can’t see it. I’m not the only one that has that problem. That’s one of the reasons that they quit making watermarks in about 1916. There are different types of watermarks. For the United States stamps, at least the ones that I’m working with, there are really only three. There’s a double-line and a single line and a revenue USIR watermark. It was used for revenue stamps, and the paper that they used to make revenue stamps was accidentally used to make some ordinary stamps. Those stamps are worth a premium. It would be almost impossible to collect United States stamps without understanding watermarks. The paper types are also critical in identifying a lot of stamps, in terms of whether it’s soft paper or hard paper. That you determine by holding it to the light and seeing if it’s a mottled look or if it looks pretty uniform. Collectors Weekly: What about perforations? Allen: Perforations are those little squiggly things around the edges of the stamp. Some stamps are called imperforate, and that means that they never had perforations. Actually all stamps are imperforate when they started off, and when they’re printed, it’s printed on a sheet. There are no perforations on the sheet. After the sheet of paper is printed, then perforations are added. The perforations are like those ballots that got so much fame back in 2000. You punch all the holes and then you get little, tiny pieces of paper called chads. So all those tiny holes in the paper are the perforations. The whole point of the perforations is to make tearing the stamps apart a lot easier. If it’s not perforated, then you have to use a pair of scissors to cut them apart, which is what they did for the first 10 years, from 1847 to 1857 in the U.S.
A stamp that is ordinarily perforated, even a modern stamp, can be worth a small fortune if it’s imperforate because it’s an error and it wasn’t supposed to be released to the public. That goes back to the obsessive-compulsive nature of collectors. They have to have one of each kind. Inspectors who work where the stamps are printed are supposed to pull those error sheets and throw them out. Sometimes they escape the inspectors’ examination and they get through, and when they do, you have a collectible variety. That’s pretty much the same for almost all the stamps, going way back to the beginning. If the inspectors let it get through, you might have a really rare stamp. Collectors Weekly: Can you explain about secret marks? Allen: There were two companies involved in this. 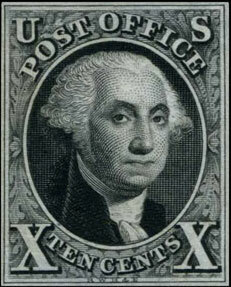 One, the National Bank Note Company, printed stamps for the Post Office. They printed them back in 1870, and then they lost their contract. In 1873, a new company took over called Continental Bank Note Company. I’m not sure who added the secret marks, Continental or National, but one of the two companies put those secret marks on the stamps so that they could identify which company printed them in case there was any recourse later on for any shoddy printing. Not all the stamps have secret marks. In fact, there are chat boards that I frequent, and some of them have just incredibly vitriolic arguments regarding these secret marks. Since this was 150 years or so ago, how’s anybody really going to know for sure? All you can do is just present whatever evidence is available. I don’t understand the emotional attachment, but this attachment can mean a lot in terms of dollars. There’s one stamp in particular where there’s only one copy known. They identify it as a Continental stamp rather than a National stamp. 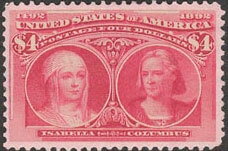 The stamp sold for over $300,000, and there’s still a lot of argument of whether or not it was printed by Continental. You have topnotch people going crazy over whether or not the stamp is National or Continental, and the arguments get pretty heated at times. Collectors Weekly: What are some of your favorite designs in your collection? Allen: I’ve been watching the Internet lately for varieties of the 1857 1-cent stamp. They’re not in the greatest condition, and they’ll probably have very little resale value over what I bought them for, but they’re position pieces and they have interesting aspects to them. So you can look forward to a 1-cent 1857 identifier coming up on the website in the next couple of years if I can get enough of the varieties! I like the “Cattle in the Storm” stamp. I like most of the Columbians. I like the 1-dollar black stamps. For some reason, the black engravings just seem to come out. There’s a small enough quantity of black stamps that were issued by the United States that it’s not overwhelming. But on the other hand, I really love all the colors of the Washington/Franklin issue. It’s like going through a 64-crayon Crayola box when you were a kid. By the way, those colors had a special significance. 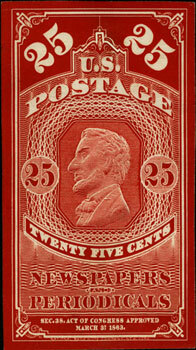 The Universal Postal Union in the 1870s through the 1890s encouraged all the countries that belonged to the Union to use a specific color for denomination. That way, anybody throughout the world would know that a green stamp was 1 cent or franc or mark, and red stamps were 2 cents or francs or marks. Three cents was purple, 4 cents was brown, blue was 5, yellow was 10, and it just goes on and on like that. So if anybody sees the color, they know the denomination. It made identification a lot easier. That stopped in the 1940s when they started making multicolor stamps. Obviously, with the multicolor stamps, identifying the denomination by a single color is meaningless. There are some stamp collectors who do collect by color. You can collect any way you want. It’s called topical collecting. Some people collect just animals or cars. There are people that collect baseball stamps around the world. You can collect just about any topic you can name. One country probably doesn’t make a whole bunch on one specific topic, but if you’re willing to collect the whole world, then you can get a lot of stamps with that topic. Collectors Weekly: What were the major influences on U.S. stamp designs? Allen: The reason that they used faces so much in the beginning was that the human mind identifies the face more readily than just about any other image, so if you’re trying to counterfeit a face to make it look exactly the same, people will notice small differences more readily. England used to use pictures of their monarchs for a lot of their postage. If somebody tried to counterfeit it, well, everybody knows what the monarch looks like, so they would know just by looking at it that it was counterfeit. Even a small difference – a line missing here or out of place there – people will notice really quickly. So it’s a security feature in that sense. 1948 was the year that people realized, “This is too many stamps for one year.” There was a huge public outcry by all the stamp collectors: “What is the government doing, putting out all these stamps this year? They’re in it for the money. They’re printing these stamps just so that they can get all us collectors to buy these things.” That hasn’t changed, but that’s been 60 years in the making. When they started putting out Bugs Bunny stamps and Elvis stamps, all those kind of things, there was the same outcry by stamp collectors. Somewhere in the 1970s it just got ridiculous. There were just so many new issues being made that a lot of less serious collectors just said, “No, I’m going to restrict my collecting.” You can see that. There’s just a tremendous percentage of collectors who only collect pre-1930. Originally, the post office came out with what are called series. The entire series wasn’t necessarily issued on the same day or the same year. They might issue one or two or three of them the first day. A lot of times they issued the stamps because if there was a rate change, they needed to issue a new stamp to meet that postal need. The idea was so you only needed to use one stamp. Collectors Weekly: When did they start making commemorative stamps? Allen: That’s up in the air. 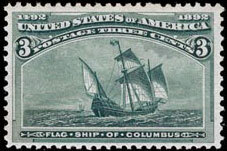 For the United States, a lot of people claim that the 1869 issue was commemorative, but for the most part, it’s still considered a regular issue series. They’re called the 1869 pictorials, and they were the first ones that didn’t have primarily images of faces. 1893 is really when the first commemoratives came out, and that is the Columbians. I’m not positive but my feeling from what I’ve read is that the primary purpose of commemoratives for at least the first 30 years was to promote some kind of exhibition like a fair. For the Columbians, they were trying to promote the Columbian World Fair in Chicago. All throughout the country, everybody was aware that there was this exhibition going on in Chicago in 1893. And then in 1898, there was an exhibition in Omaha, and so they printed what’s called the Omaha series. Like I said, my favorite stamp is the “Cattle in the Storm,” which is from that series. Subsequently, commemorative stamps started to commemorate important American events. There was a series called the 2-cent reds from the ‘20s and ‘30s, which commemorated the 150th anniversary of the Revolutionary War. There were many different stamps commemorating different battles and important events from the Revolutionary War. Then they went on to commemorate other things. Like I said, in 1948 they went nuts and had a stamp that commemorated the poultry industry and a bunch of other things. A lot of people thought, “This isn’t quite what we had in mind.” But I’m sure there are a lot of people that think that the poultry industry is a really important part of Americana. There are a lot of people who think that Elvis is a very important part of American history, as well. Of course, the person on the stamp has to be dead. That’s the number one requirement. There’s even some debate about whether there’s any law that says so or if it’s just a tradition, but it’s followed just the same. Collectors Weekly: What are female versus male stamps? Allen: There was a little experiment done back in the late 1860s where they were trying to keep people from taking stamps off the envelope and reusing them. There were people that figured out a way to dissolve the cancellation ink and make the stamp look unused so it could be reused. To keep people from doing that, they decided to emboss indentations into the stamps so the ink would be absorbed when they canceled them. They’re called grills. It’s like a waffle iron pressing into the stamp and creating an indentation. When viewed from the back of the stamp, if the grill points are up it is called a male grill and if they point down it’s considered female. The Parcel Post Stamps – Designs of 1913, The Parcel Post and the Parcel Post Postage Due stamps were printed by the Bureau of Engraving & Printing using 180 subject flat plates on single-line watermarked paper and were perforated 12. The sheets were cut into four panes of 45 stamps before delivery to Post Offices. They were only used for about five or six years, and then they said, “No, this just isn’t working.” That’s pretty much the way a lot of things were done with stamps. They would try something and then they’d say, “No, this isn’t working. Let’s try this.” Or somebody would come up with a better way, so they’d discontinue it. Of course, now they use a tagging on the stamp. The point of tagging is to automate the mail sorting process, but it can have the added bonus of detecting reused stamps if the phosphorescent is removed after soaking. Every once in a while, somebody gets caught doing bulk mailing with reused stamps and they get in big trouble. But people reusing stamps isn’t a major source of revenue loss for the post office. I don’t know if it ever was, but it’s still something you have to think about. Allen: They can be highly collectible. 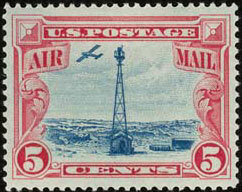 Obviously the most famous stamp for Americans is the upside down airplane called the inverted Jenny. Even non-collectors know about the upside down airplane stamp. The airmail stamp is a specialized category, and I think a lot of people are attracted to it because a lot of the more popular airmails were from the early period of pioneer flight in the United States. There’s a romantic quality about collecting airmail stamps. It was a special time and a special place, and some of the flyers’ stories were bigger than life. Collectors Weekly: Can you tell us about plate blocks? Why are some blocks of six and others blocks of four? Allen: That’s just a matter of flat plate stamps versus the rotary. To get the plate block number to be centered on flat plate stamps, you need six stamps, but for the rotary stamps, because it was in the corner, you only need four stamps. That was considered a complete plate block, which was nice for a lot of collectors because then you only have to collect four of the stamps instead of six. In the beginning, most plate block collectors were not plate block collectors. They collected just the top three stamps because the top three stamps would have all the information – that is, the marginal imprint with the name of the printer and the plate number. Basically when you go to the post office and you ask for stamps, you can get what’s called a pane of stamps, which is different than the sheet of stamps that’s actually printed. When the sheet comes out, it might have 200 to 400 stamps, or all different amounts, and usually they’ll cut those apart. Typically there might be a sheet of 400, let’s say, and they cut it into four panes of 100. A lot of people call those sheets, but it’s actually a pane because it’s a part of the whole sheet. So when you go to the post office, you might ask for a pane of 100 stamps or you might ask instead, “Would you mind just tearing off the plate block?” This resulted in a lot of panes of stamps with just the plate blocks removed. Nobody wanted any other stamps, so they ended up sending them back to the Bureau and the Bureau would destroy them. That happened quite a bit, since many collectors just wanted the plate blocks. In the 1990s, they weren’t printing plate numbers anymore, and plate block collectors were screaming about that. Collecting plate block numbers has really changed in the last 20 years, and I’m not up on what’s going on with that. Plate block collecting was really big 50 to 70 years ago. Getting back to the obsessive-compulsive nature of collectors, there’s a lot of collectors that had to have one of each plate number, and there’s literally tens of thousands of plate numbers. Collectors Weekly: What trends have you noticed in stamp collecting in the last few years? The Newspaper and Periodical Stamps Designs of 1865 – The Newspaper and Periodical stamps of 1865 were designed and printed by the National Bank Note Company. Allen: I think the biggest one is that people are going more and more to the Internet. The good thing is that there’s a lot of willingness to share information. The reason that I got into this in the first place was because I just couldn’t find the information I needed. I had no idea, and I probably should have gone to the stamp dealer locally and just asked him, “What books do I need to familiarize myself with?” There was nothing on the Internet at all really in the beginning, and when I started 1847usa back in 1998, I was the only guy on the block that I was aware of. Then little by little, a lot of other people started adding things. I’m surprised that anybody’s still going to 1847usa because there are some really good sites out there right now that have a lot of information. That’s why I’m hoping the new identifiers that I’m coming out with will still prove useful and informative. That’s probably what my little niche is going to be, just in terms of quick identification for all the different varieties. My favorite website is Robert A. Siegel Auction Galleries at http://www.siegelauctions.com. Once there, click on “Siegel powersearch” in the left-hand column. Typing the Scott number in the Catalogue # Equals box and hitting the green search button often provides wondrous results. Then there are people who want to know how much their stamp is worth. The Scott catalogue does a very poor job at valuing anything other than one specific condition, i.e. very fine (VF), and this can be a real stumbling block to a lot of collectors who read the Scott catalogue and think their stamps are worth far more than they actually are. This can actually work in the other direction as well, since superbly centered stamps can be worth a premium far in excess of the stated catalogue value for VF. In fact, the single most important criteria for valuing one’s stamps is centering and condition, even more so than the Scott number, something that is counterintuitive to most collectors. So I can not overemphasize the importance of the PSE Online Price Guide website. The third website I would like to recommend is an up-and-comer called Arago at http://www.arago.si.edu. The navigation is still a little clunky in my opinion, but they are doing so much I don’t know how they could make it better. Fortunately, they have a search function and of course Google finds them in many searches, but their Home Page doesn’t really offer that many options. Still, it is an impressive website and they have access to some of the most desirable stamps in all of philately and are fond of displaying them. Finally, I would like to mention one chatboard that should be frequented by every collector, and that is Richard Frajola’s Board for Philatelists. I usually read it once a week and am therefore not really a participant, rather a “lurker,” but I find the discussions fascinating and informative. Collectors Weekly: Are there any books on stamp collecting that you would recommend? Allen: There’s more information written on stamps than probably any other hobby that’s out there. Some people just get so wrapped up in it and so serious about their specialty that it’s mind-blowing. A lot of it can be really boring, but a lot of it’s interesting. You have to get hooked, but once you get hooked, there’s enough out there to keep you going for a lifetime. Don’t do what I did, which is generalize – there’s just so much out there. You need to specialize. There’s not enough time even in a lifetime to do everything. Just all the different things you’ve asked me about today, any one of those, you could spend a lifetime specializing in. There are three sets of books I feel should be in every U.S. stamp collector’s library. The first is Brookman’s The United States Postage Stamps of the 19th Century, either the two volume set or the three volume set, with the two volume set being, for all practical purposes, nearly as good as the three volume set, and a lot cheaper. 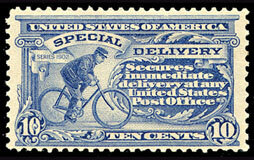 The second is Johl’s United States Postage Stamps 1902-1935, Quarterman reprint, which is the cheapest way to buy this. It also comes in a four-volume set, but this can be rather pricey. Finally, Encyclopedia of United States Stamps and Stamp Collecting by Rodney Juell and Steven Rod, which is a recent book, but very worthwhile. These three items should be available with a little shopping for somewhere in the $100 range and would be the best investment a beginning to intermediate U.S. collector could make – along with taking the time to read them, of course! My bias is toward U.S. stamps, not because I’m nationalistic; but because I had to limit myself. If you’re just going to dabble, you could get stamps from all around the world, and have a lot of fun doing that and just filling holes in your albums. But the number one recommendation I would make is to dabble for a few months and then try really hard to find something you’re particularly interested in. Then little by little, narrow it down and specialize. I don’t care what you specialize in; there’s somebody on the Internet and there are groups of people that will be glad to help you move in that direction. To me, stamp collecting is great for people that don’t have the mobility that other people have. It’s a good match, and maybe it’s relaxing. There are some young people that are doing it, too; it’s not just old people. Allen: It’s hard to say. I think that the big collecting group, American Philatelic Society, is having some troubles right now. I don’t know if that’s related to the number of collectors going down or not. There are other things out there more exciting or shinier that people are attracted to, I guess. There are a lot of people that look at stamp collectors and go, “What the heck are you doing?” When I go to family gatherings, I keep a low profile. But I find it very fascinating. Like I say, every day there’s something new that I learn, which is nice. (All images in this article courtesy of Bob Allen of 1847usa.com). My mother passed away in February and I have numerous 1 cent stamps already plus a 1/2 cent. I have not even looked at the ones in the attic yet. Are these of any value or is it a waste of my time? I have a Scott# 114 used with a “Double Grill, One Quadruple Split” and a PSE Cert. Is this considered a rarity? I have found the stamps with grills to be interesting and a challenge. Still looking for the 1 cent, “Z Grill”!!! What a shame that AMos Press have once again wielded their big guns and forced BoB allen’s site 1847USA to close down. I always found this site most informative for early US (much more so than Scott – which may be partly the reason). Not sure what Bob was doing to harm Scott – I’d have thought the reverse and giving them free publicity. Hello, My dad left me a stamp collection. after looking through it, I noticed a stamp that is listed as a rare stamp. 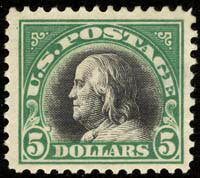 It is the Ben Franklin 1908, 1 cent stamp. blue/Green/Hinged. what could possibly be the value of this stamp. any early (19th century) stamps issued without gum? extensive knowledge of stamp collecting. Hi! So happy to have found you. I have stamps on postcards from my grandfather’s brother. Harry traveled some and kept in touch this way. I only met him once. The steps are from around 1900.